In this unique volume, father-and-son team Walter and John Brueggemann take a close look at our fractured American society and suggest ways for improvement. Using six themes identified by some scholars as the moral foundations of society—care, fairness, liberty, loyalty, authority, and sanctity—they examine the unsustainable patterns of our contemporary society and reveal how those patterns played out in the ancient world of the Old Testament. 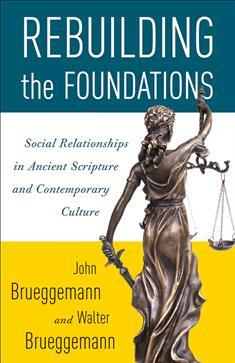 Brueggemann and Brueggemann demonstrate how comparing the current state of these moral foundations with what God wanted them to be can help us better respond to the challenges of today. They assert that achieving any significant change will require the work of all of us and will be grounded in a vision of neighborliness. Rebuilding the Foundations will inspire readers to reorient toward a better way of living, both for themselves and for all living things. "Walter and John Brueggemann have written a startlingly insightful and important book addressing some of the most important issues facing the human race today. John draws from contemporary sociology, Walter from his unique and deeply insightful approach to the Hebrew Bible, and each presents a progressive and at points revolutionary worldview that will give readers a solid intellectual and spiritual foundation for seeking a fundamental transformation of our society. Every religious leader, spiritual or secular activist, and anyone hoping to build a saner and more ethically coherent society must read this book!" "This jewel of a book offers a rich conversation between a biblical theologian father and a sociologist son on caring for each other and the world, learning from each other, and making it real. Every Walter Brueggemann book demonstrates the social relevance of profound biblical scholarship. This one, thanks to John Brueggemann, ranks very high for insightful relevance." "Rebuilding the Foundations offers a clear, lucid, and compelling discussion of current social issues with insights from the intersection of biblical interpretation and sociology. A profound synthesis of the sociological and prophetic imaginations." "In the tradition of the best of American theology this son-father duo marries critical sociology and Scripture, issuing in a searing prophetic cry to fellow Americans that the oppression of the poor and the degradation of the earth cannot last without the destruction of our soul. They do not for a moment take their eyes off God's righteousness, which, simply put, is the way to peace. That two generations in this creative family are so much in tune with the truth is in itself a hopeful sign of the Light that will not be overcome by the darkness of our time."